Engineers utilizing Steel Shop Drawing Review (Model Review) technology are finding they are improving the quality of their review, in addition to saving time and having more fun. Once implemented, most engineers comment how they would not want to go back to the former processes. SE University would like to provide information to engineers who wish to learn more about the model review process. Below you will find links to articles and videos focused on model review, as well as vendors that provide programs for model review. If you have any questions about how to implement model review in your office, please contact Brian Quinn, P.E., at 616-546-9420 or by email at Brian.Quinn@LearnWithSEU.com. Model Exchange and Review Live by Jim Corsiglia, P.E., S.E., and Richard Steffens. MSC, April, 2011. I’ll Volunteer to Review the Shop Drawings by Brian Quinn, P.E. and Lisa Willard, P.E. MSC, February, 2010. 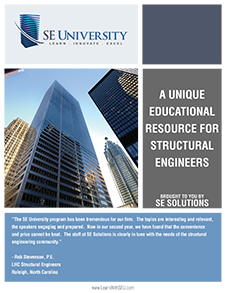 Suggestions for improving the Strucural Steel Shop Drawing Review Process (a White Paper from the Structural Engineers of Colorado). I’ll Volunteer to Review the Shop Drawings! SE University, April 2010 Session. This 90-minute presentation featured case studies from 2 engineers and 1 fabricator, and short presentations by Design Data and Tekla. SDS/2 Approval by Design Data. Enhanced Submittal Review by Tekla Structures.